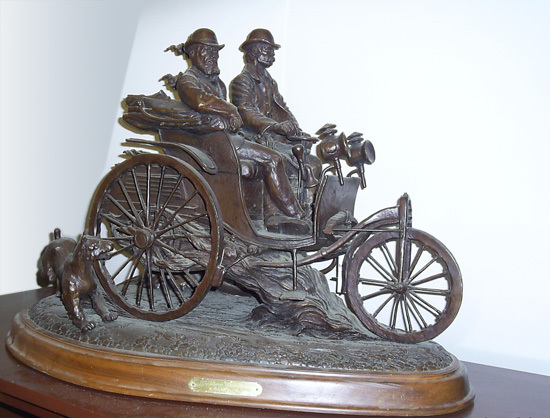 The bronze sculpture, titled 5 Miles to the Gallon, was produced by Stanley Wanlass, a professor at the European Art Academy in Paris and the University of Grenoble in France. In 2005, he headed a design studio based in Oregon. Wanlass is an internationally known automotive sculptor and painter. 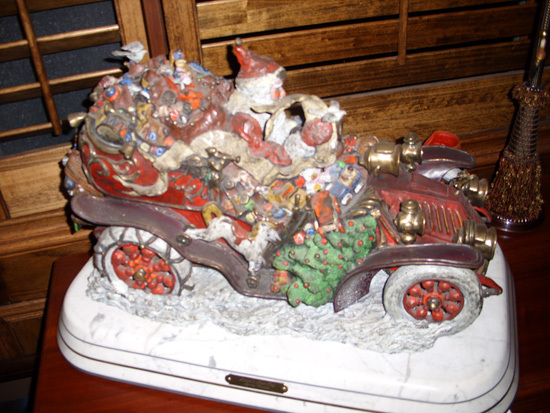 Five Miles to the Gallon was sculpted and cast by Wanlass in 1985. The scene depicts a wealthy couple who have run out of gas in their automobile and are forced to head for the nearest gasoline seller some five miles away. Their faithful Collie dog leads the way as their journey is illuminated by their oil lamps taken from their abandoned car. It is cold and they hold their coats close to themselves. Their journey will be long and difficult, and the gasoline they so desperately need, has just risen to 6 cents a gallon! This bronze has a circular base, there are four scenes of ancient motor cars encircled thereon. Presenting at the NM plateau, the item is numbered “FC/35″ thus identifying this as a first casting. Weighing 50 pounds and measuring 26-1/4″ x 17-1/2″, it is also signed “Wanlass” at its rear. The remarkable piece of artwork rests on a 15-1/4″ marble base. Santa’s New Toy 28″ long, hand painted bronze on carrara marble / metal base. Limited edition of 88 (hand painted), 10 (sterling)..